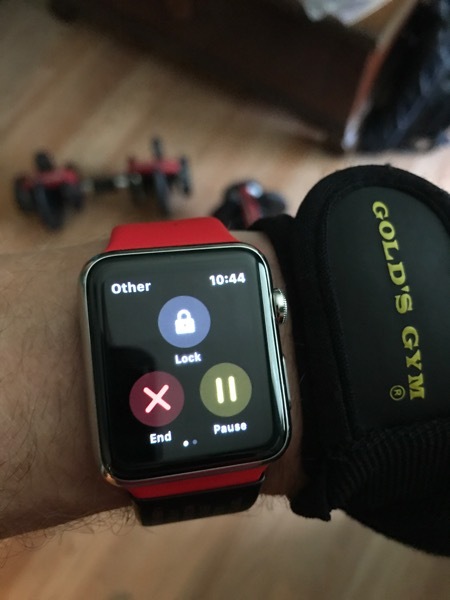 Here is a simple but absolutely necessary tip for anyone working out with an Apple Watch. If you haven't encountered this issue already you will eventually. If I am doing any kind of exercise that either involves gloves (cycling gloves or weightlifting gloves) or involves bending my wrist I end up accidentally pressing the crown on the Apple Watch a lot during the workout. This generally leads to Siri prompting me from the Watch for a verbal request. There is an easy way to keep this from happening. Then press the "Lock" button. This will lock down the Watch so that the only thing pressing the screen, digital crown or side button will do is to wake up the screen. In order to make any kind of input to the Apple Watch now that it is locked you must rotate the digital crown to unlock it.